This pass assigns indexes to each instruction. Definition at line 328 of file SlotIndexes.h. Definition at line 511 of file SlotIndexes.h. Definition at line 368 of file SlotIndexes.h. Definition at line 372 of file SlotIndexes.h. References llvm::iplist_impl< IntrusiveListT, TraitsT >::clearAndLeakNodesUnsafely(), and llvm::dump(). Move iterator to the next IdxMBBPair where the SlotIndex is greater or equal to To. Definition at line 515 of file SlotIndexes.h. References llvm::SmallVectorTemplateCommon< T, typename >::end(), and llvm::lower_bound(). Definition at line 253 of file SlotIndexes.cpp. Free the resources that were required to maintain a SlotIndex. Once an index is no longer needed (for instance because the instruction at that index has been moved), the resources required to maintain the index can be relinquished to reduce memory use and improve renumbering performance. Any remaining SlotIndex objects that point to the same index are left 'dangling' (much the same as a dangling pointer to a freed object) and should not be accessed, except to destruct them. Like dangling pointers, access to dangling SlotIndexes can cause painful-to-track-down bugs, especially if the memory for the index previously pointed to has been re-used. To detect dangling SlotIndex bugs, build with EXPENSIVE_CHECKS=1. This will cause "erased" indexes to be retained in a graveyard instead of being freed. Operations on indexes in the graveyard will trigger an assertion. Definition at line 698 of file SlotIndexes.h. References entry, llvm::iplist_impl< IntrusiveListT, TraitsT >::erase(), llvm::iplist_impl< IntrusiveListT, TraitsT >::push_back(), and llvm::iplist_impl< IntrusiveListT, TraitsT >::remove(). Get an iterator pointing to the IdxMBBPair with the biggest SlotIndex that is greater or equal to Idx. Definition at line 521 of file SlotIndexes.h. Definition at line 27 of file SlotIndexes.cpp. getIndexAfter - Returns the index of the first indexed instruction after MI, or the end index of its basic block. MI is not required to have an index. Definition at line 463 of file SlotIndexes.h. References assert(), E, llvm::DenseMapBase< DerivedT, KeyT, ValueT, KeyInfoT, BucketT >::end(), llvm::MachineBasicBlock::end(), llvm::DenseMapBase< DerivedT, KeyT, ValueT, KeyInfoT, BucketT >::find(), llvm::MachineInstr::getParent(), I, and MI. getIndexBefore - Returns the index of the last indexed instruction before MI, or the start index of its basic block. Definition at line 446 of file SlotIndexes.h. References assert(), B, llvm::MachineBasicBlock::begin(), llvm::DenseMapBase< DerivedT, KeyT, ValueT, KeyInfoT, BucketT >::end(), llvm::DenseMapBase< DerivedT, KeyT, ValueT, KeyInfoT, BucketT >::find(), llvm::MachineInstr::getParent(), I, and MI. Returns the instruction for the given index, or null if the given index has no instruction associated with it. Definition at line 427 of file SlotIndexes.h. Referenced by llvm::LiveIntervals::getInstructionFromIndex(), getNumAllocatableRegsForConstraints(), llvm::LiveRange::overlaps(), llvm::HexagonRegisterInfo::shouldCoalesce(), stripValuesNotDefiningMask(), and llvm::LiveIntervals::HMEditor::updateAllRanges(). Definition at line 411 of file SlotIndexes.h. References assert(), llvm::DenseMapBase< DerivedT, KeyT, ValueT, KeyInfoT, BucketT >::end(), llvm::DenseMapBase< DerivedT, KeyT, ValueT, KeyInfoT, BucketT >::find(), llvm::getBundleEnd(), llvm::getBundleStart(), llvm::ilist_node_impl< OptionsT >::getIterator(), and llvm::skipDebugInstructionsForward(). Referenced by llvm::LiveInterval::computeSubRangeUndefs(), createDeadDef(), llvm::LiveRangeCalc::createDeadDefs(), llvm::SystemZInstrInfo::foldMemoryOperandImpl(), llvm::LiveIntervals::getInstructionIndex(), getStartOrEndSlot(), matchPair(), llvm::LiveIntervals::print(), llvm::MachineBasicBlock::print(), llvm::LiveIntervals::HMEditor::updateAllRanges(), and llvm::MachineFunction::verify(). 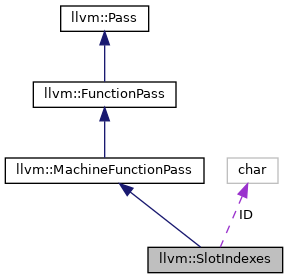 Definition at line 400 of file SlotIndexes.h. Returns the MBB covering the given range, or null if the range covers more than one basic block. Definition at line 554 of file SlotIndexes.h. Definition at line 500 of file SlotIndexes.h. Referenced by llvm::LiveRangeCalc::createDeadDefs(), createSegmentsForValues(), llvm::LiveIntervals::getMBBEndIdx(), getStartOrEndSlot(), llvm::LiveIntervals::hasPHIKill(), matchPair(), llvm::LiveIntervals::pruneValue(), subRangeLiveAt(), and llvm::MachineFunction::verify(). Returns the last index in the given basic block. Definition at line 505 of file SlotIndexes.h. Definition at line 536 of file SlotIndexes.h. References assert(), llvm::SmallVectorBase::empty(), I, and MI. Referenced by createSegmentsForValues(), llvm::LiveRangeCalc::extend(), llvm::LiveIntervals::getMBBFromIndex(), llvm::LiveRangeCalc::isJointlyDominated(), llvm::LiveIntervals::pruneValue(), subRangeLiveAt(), and llvm::LiveIntervals::HMEditor::updateAllRanges(). Definition at line 479 of file SlotIndexes.h. 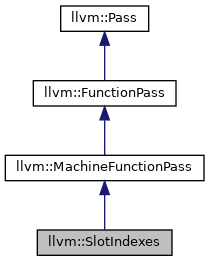 Return the (start,end) range of the given basic block. Definition at line 485 of file SlotIndexes.h. Definition at line 490 of file SlotIndexes.h. Referenced by createSegmentsForValues(), llvm::LiveRangeCalc::extend(), llvm::LiveIntervals::getMBBStartIdx(), getStartOrEndSlot(), matchPair(), llvm::LiveIntervals::print(), llvm::MachineBasicBlock::print(), llvm::GCNScheduleDAGMILive::schedule(), and llvm::MachineFunction::verify(). Returns the first index in the given basic block. Definition at line 495 of file SlotIndexes.h. Returns the next non-null index, if one exists. Definition at line 433 of file SlotIndexes.h. References E, llvm::ilist_node_impl< OptionsT >::getIterator(), and I.
Referenced by llvm::LiveRange::isZeroLength(), and llvm::LiveIntervals::HMEditor::updateAllRanges(). Definition at line 394 of file SlotIndexes.h. Referenced by llvm::createGreedyRegisterAllocator(), and getStartOrEndSlot(). Definition at line 406 of file SlotIndexes.h. References llvm::DenseMapBase< DerivedT, KeyT, ValueT, KeyInfoT, BucketT >::count(). Referenced by llvm::LiveIntervals::isNotInMIMap(), matchPair(), llvm::MachineBasicBlock::print(), and llvm::MachineFunction::verify(). Returns the assigned index. If Late is set and there are null indexes between mi's neighboring instructions, create the new index after the null indexes instead of before them. Definition at line 580 of file SlotIndexes.h. References assert(), llvm::DenseMapBase< DerivedT, KeyT, ValueT, KeyInfoT, BucketT >::end(), llvm::DenseMapBase< DerivedT, KeyT, ValueT, KeyInfoT, BucketT >::find(), llvm::MachineInstr::getParent(), llvm::DenseMapBase< DerivedT, KeyT, ValueT, KeyInfoT, BucketT >::insert(), llvm::iplist_impl< IntrusiveListT, TraitsT >::insert(), llvm::MachineInstr::isDebugInstr(), llvm::MachineInstr::isInsideBundle(), and MI. Referenced by llvm::SplitEditor::dump(), llvm::LiveIntervals::InsertMachineInstrInMaps(), llvm::LiveIntervals::InsertMachineInstrRangeInMaps(), and llvm::MachinePipeliner::runOnMachineFunction(). Add the given MachineBasicBlock into the maps. Definition at line 648 of file SlotIndexes.h. References assert(), llvm::MachineFunction::end(), llvm::ilist_node_impl< OptionsT >::getIterator(), llvm::MachineBasicBlock::getNumber(), llvm::MachineBasicBlock::getParent(), llvm::iplist_impl< IntrusiveListT, TraitsT >::insert(), llvm::iplist_impl< IntrusiveListT, TraitsT >::insertAfter(), llvm::SmallVectorTemplateBase< T, bool >::push_back(), llvm::SmallVectorTemplateBase< T >::push_back(), llvm::SmallVectorBase::size(), and llvm::sort(). Returns an iterator for the begin of the idx2MBBMap. Definition at line 526 of file SlotIndexes.h. Return an iterator for the end of the idx2MBBMap. Definition at line 531 of file SlotIndexes.h. Definition at line 32 of file SlotIndexes.cpp. References llvm::DenseMapBase< DerivedT, KeyT, ValueT, KeyInfoT, BucketT >::clear(), llvm::iplist_impl< IntrusiveListT, TraitsT >::clear(), llvm::SmallVectorImpl< T >::clear(), and llvm::BumpPtrAllocatorImpl< AllocatorT, SlabSize, SizeThreshold >::Reset(). This should be called before MachineInstr::eraseFromParent() is used to remove a whole bundle or an unbundled instruction. Definition at line 105 of file SlotIndexes.cpp. References assert(), llvm::DenseMapBase< DerivedT, KeyT, ValueT, KeyInfoT, BucketT >::end(), llvm::DenseMapBase< DerivedT, KeyT, ValueT, KeyInfoT, BucketT >::erase(), llvm::DenseMapBase< DerivedT, KeyT, ValueT, KeyInfoT, BucketT >::find(), llvm::IndexListEntry::getInstr(), llvm::MachineInstr::isBundledWithPred(), and llvm::IndexListEntry::setInstr(). This should be called before MachineInstr::eraseFromBundle() is used to remove a single instruction (out of a bundle). Definition at line 120 of file SlotIndexes.cpp. References assert(), llvm::DenseMapBase< DerivedT, KeyT, ValueT, KeyInfoT, BucketT >::end(), llvm::DenseMapBase< DerivedT, KeyT, ValueT, KeyInfoT, BucketT >::erase(), llvm::DenseMapBase< DerivedT, KeyT, ValueT, KeyInfoT, BucketT >::find(), llvm::IndexListEntry::getInstr(), llvm::ilist_node_impl< OptionsT >::getIterator(), llvm::DenseMapBase< DerivedT, KeyT, ValueT, KeyInfoT, BucketT >::insert(), llvm::MachineInstr::isBundledWithPred(), llvm::MachineInstr::isBundledWithSucc(), and llvm::IndexListEntry::setInstr(). Definition at line 147 of file SlotIndexes.cpp. References llvm::dbgs(), E, I, llvm::SlotIndex::InstrDist, LLVM_DEBUG, and Space. Definition at line 182 of file SlotIndexes.cpp. ReplaceMachineInstrInMaps - Replacing a machine instr with a new one in maps used by register allocator. the index where the new instruction was inserted. Definition at line 633 of file SlotIndexes.h. References assert(), llvm::DenseMapBase< DerivedT, KeyT, ValueT, KeyInfoT, BucketT >::end(), llvm::DenseMapBase< DerivedT, KeyT, ValueT, KeyInfoT, BucketT >::erase(), llvm::DenseMapBase< DerivedT, KeyT, ValueT, KeyInfoT, BucketT >::find(), and llvm::DenseMapBase< DerivedT, KeyT, ValueT, KeyInfoT, BucketT >::insert(). Definition at line 40 of file SlotIndexes.cpp. References assert(), llvm::dbgs(), llvm::SmallVectorBase::empty(), llvm::DenseMapBase< DerivedT, KeyT, ValueT, KeyInfoT, BucketT >::empty(), llvm::MachineFunction::getNumBlockIDs(), llvm::DenseMapBase< DerivedT, KeyT, ValueT, KeyInfoT, BucketT >::insert(), llvm::SlotIndex::InstrDist, LLVM_DEBUG, MI, llvm::SmallVectorTemplateBase< T, bool >::push_back(), llvm::iplist_impl< IntrusiveListT, TraitsT >::push_back(), llvm::SmallVectorImpl< T >::reserve(), llvm::MachineFunction::size(), and llvm::sort(). Definition at line 366 of file SlotIndexes.h.